Cook pasta according to package directions. Drain and rinse under cold water until cool. Meanwhile, stir together drained tomatoes, mayonnaise and garlic salt in large bowl. 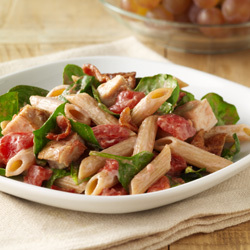 Add pasta, chicken and bacon; toss to combine ingredients. Add spinach; gently toss together. Serve immediately.